The Chinese regime’s persecution of the Falun Gong spiritual group continues. Minghui.org, a U.S.-based Falun Gong information website, which collects information directly from practitioners and their family members, released their report for 2014, confirming 91 deaths due to torture, 6,415 detentions without trial, and 983 adherents tried and sentenced for their beliefs last year. Considering the regime’s censorship of information about Falun Gong, the actual number of cases is expected to be much higher. At least 6415 Falun Gong practitioners in 30 Chinese provinces and regions were detained without trial for their beliefs in 2014, that is 29.8 percent more than the 4942 people Minghui confirmed as detained in its 2013 report. Many of the detained Falun Gong practitioners were tortured during detention. Some were extorted, some were subjected to brainwashing, and some were given blood tests, which were very likely administered in preparation for possibly harvesting their organs. At least 983 Falun Gong practitioners, in 29 provinces and regions, were put on trial in 2014—a 23.5 percent increase from those tried in 2013, the report states. Of the 983 tried last year, at least 65 of them were sentenced to over seven years and the longest sentence was 12 years in prison. Most were charged with Criminal Law Article 300, a vaguely worded statute that doesn’t mention Falun Gong but is routinely used to criminalize practice of the spiritual discipline. The practitioners actual “crime”—what most likely brought them to the attention of security forces—is doing what they call “clarifying the truth.” Falun Gong practitioners are known for spreading information to people in mainland China about how the regime persecutes them and what Falun Gong is. When attorneys managed to defend Falun Gong practitioners in court—something the regime tries to prevent, the lawyers typically described the charges and trials as illegal or unconstitutional. The Chinese Communist Party often obstructs defense lawyers for Falun Gong practitioners by prohibiting them from speaking or reading their files, illegally detaining them, withdrawing their professional licenses, and so on. Many of the trials were carried out secretly, without lawyers, using fabricated evidence, and torturing the defendants, the report says. 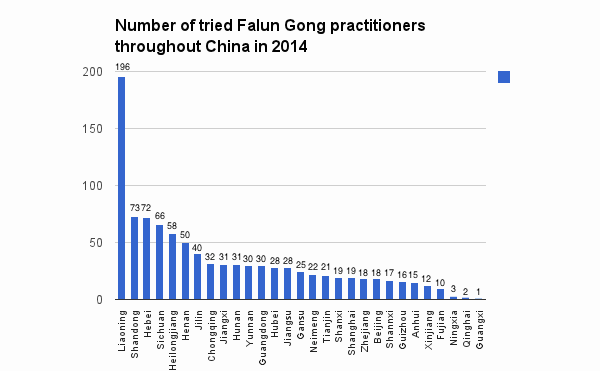 The regime’s persecution of Falun Gong is most severe in northeastern China’s Liaoning Province with 196 practitioners tried in 2014, higher than all other regions, according to Minghui. The 983 trials represent a very small sample of the regime’s widespread persecution. The more significant, yet unknown number is the many Falun Gong practitioners who have been sent to detention centers (black jails), labor camps, and prisons without trial. The official press office for Falun Gong, Falun Dafa Information Center, estimates that millions have been detained since the persecution began in 1999. 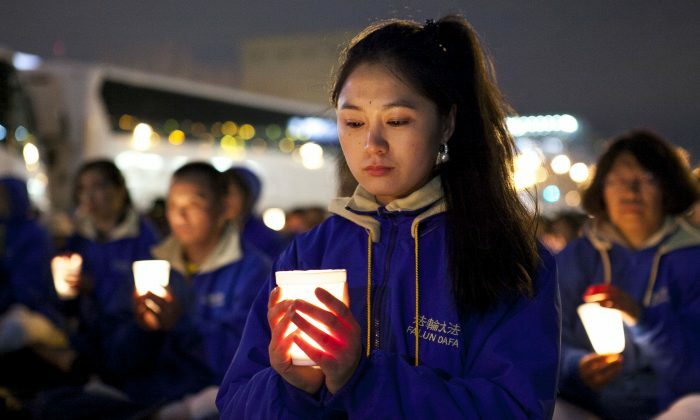 Falun Gong and other prisoner’s of conscience have also been identified by researchers as a live organ donor bank, whereby the prisoners are systematically killed for their organs for transplant surgeries. Tens of thousands of practitioners are believed to have been killed for their organs. International efforts investigating organ harvesting in China include: Canadian human rights lawyer David Matas and former Canadian Secretary of State David Kilgour who published their findings in 2009 in their book “Bloody Harvest”; and U.S. journalist and researcher Ethan Gutmann who published his book, “The Slaughter,” in 2014. The illegality of the trials stems in part from an extra-constitutional move by former Chinese Communist Party head Jiang Zemin. On June 10, 1999, Jiang Zemin gave a mandate to eradicate Falun Gong to a newly established Party organ, dubbed the 610 Office, that was given authority over all levels of police, the state bureaucracy, and the courts. In July 1999 police announced on loud speakers that it was “illegal” to practice Falun Gong and started arresting adherents in mass. Chinese lawyers regularly point out there is no law in China that bans the practice. One explanation for the persecution is that the Communist Party perceived the spiritual group—which follows the tenets of truthfulness, compassion and tolerance—as a threat to its atheistic ideology. According to Chinese state statistics in 1999, the number of Falun Gong practitioners exceeded that of Party members (numbering 65 million). Those who had taken up the practice included members of the security forces and the military and high-level CCP leaders.